We are working on my 4 year old's uppercase and lowercase letter identification. She's doing well with uppercase but it's the lowercase I think she could use more practice with. Recently we worked on a similar activity which you can read more about here. I've been saving bottle caps and thought I could use them to play a letter match and memory game. 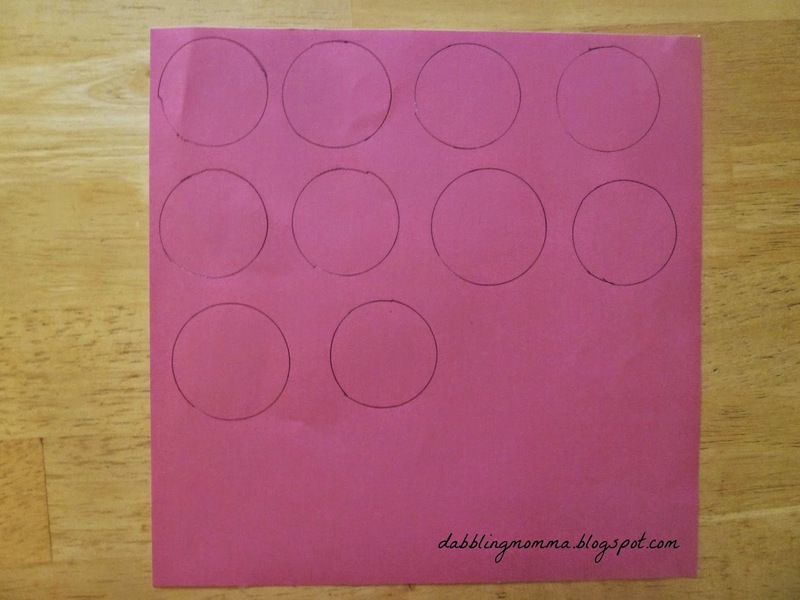 Set up: Trace the bottle caps you will be using onto your construction paper and cut out the circles. I cut just inside the circle so that they weren't too big and they fit perfectly inside the cap, no glue needed! 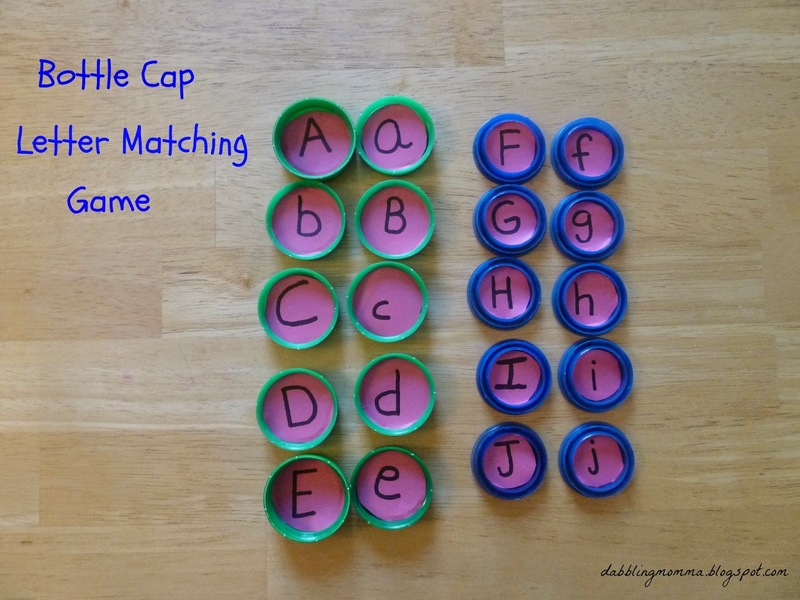 Once the circles are in place use your marker and write the lowercase and uppercase letters onto the caps. Because I am doing both uppercase and lowercase letters and did not have 52 bottle caps I chose to do just the first 10 letters of the alphabet. Besides, I think it would be to overwhelming to use that many letters in the game so even if I did have all the caps to use I still would have used only half. 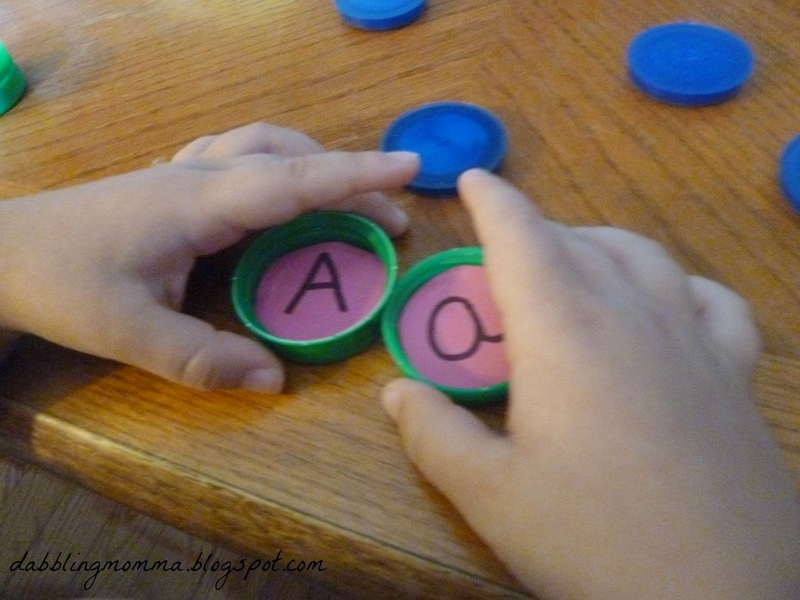 How to play: The child turns over a cap they see a letter, for example uppercase "A" they will be looking for a match by finding the lowercase "a." I thought of different ways of playing this game but since I want my daughter to recognize both uppercase and lowercase in print I went with this option. Playing this game is much like playing any other memory game. Whoever makes the most matches wins! It's really simple and really fun!! My daughter asked to play several games in a row!! How is your child learning their letters? Please let us know in the comments below or by visiting us on my Facebook page! I hope you have fun with it too, Tina! Genius! I love this! And good call with going with just the first ten letters! Great idea and activity! Will start saving my bottle caps. It really was a fun game, Angel! So simple and we always have bottle caps lying around. Pinning! Thanks, Selena! and thanks for pinning, too! Great, Amber!! We had alot of fun with this game!! I hope you do too! See that, Danya!! I've even got my Mom saving them now! I love ideas that rescue items from the bin. 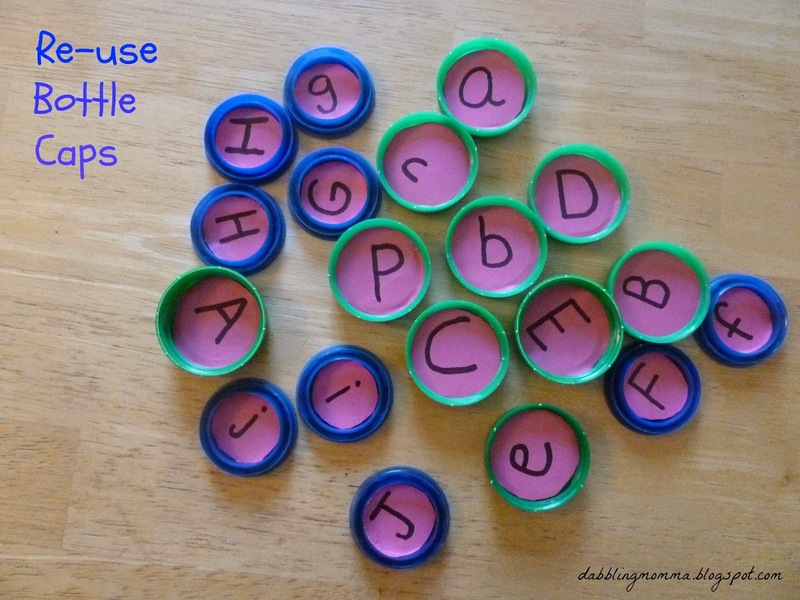 What a creative idea to learn letter recognition. My son and I will be doing this, we have plenty of bottle caps to get started. Thank you, Heather! I hope you and your son have fun with it!! So simple and fun! Pinning this! Such a simple and clever idea! I need to do this for my youngest... she would love it. This is such a fun hands, on way to practice the alphabet!! I am featuring this on TGIF this week! What a neat way to approach this:) Absolutely trying this with my daughter! Great, have fun with it Joanna!